There are now more ways to listen to WVIA’s 3 great radio channels than ever before! And you don’t even have to turn on a radio anymore! The Amazon Dot is a voice activated device that can act as a personal assistant in your home. You ask it questions and it will give you answers: What is the weather forecast? Who won the game last night? It can even play WVIA-FM for you. 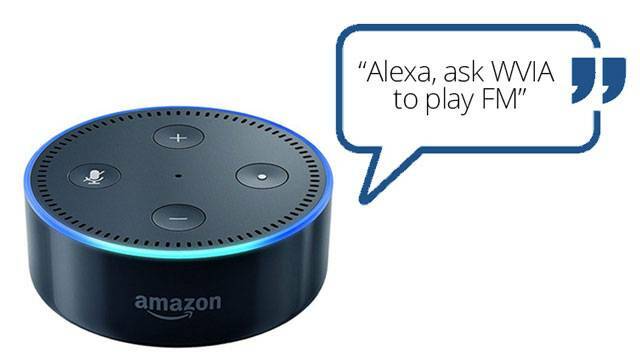 Now for anyone who owns an Amazon Echo or Amazon Dot, we encourage you to add the WVIA skill to your device, so listening to WVIA-FM is just a simple voice command away. The Echo and Dot can play all three WVIA FM channels for you with ease. As a thank you for supporting WVIA-FM this drive you can receive an Amazon Dot when you give a donation of $150.